For a change, and due to the Indie Uprising that is taking place on Xbox Live in December I'm reviewing things from my local Farm Shop. While you probably don't live within reach of this particular one it's well worth you having a look locally to find your own source of home cooked, locally grown snacks! 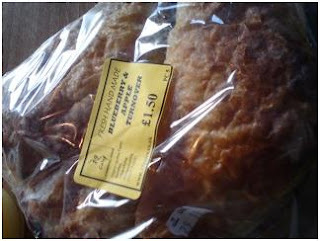 For pudding on my last trip over to 19 Gales Farm Shop I picked up a couple of these blueberry and apple turnovers. As the pork pie was so filling I decided to take them home instead, but they got a bit flattened on the way. They still tasted great and although I'm not a fan of the blueberry (raspberries every time for me) the mix of flavours was great. If these were home made for home consumption then I think I'd have doubled the fruit inside them and then had them as a massive pudding with ice-cream, but as a commercially viable product for 75p each these were fab. Also they had none of the hard sugar coating on the top which seems to blight most commercial turnovers to compensate for the lack of flavour inside - these actually tasted of fruit and were naturally sweet. I urge you to go out and seek local independent places that do fresh baking, while the chains are OK most of it is shipped to them readymade and then just heated to the finish on the premises. Truly fresh baking is great, and if you are too lazy to do it at home like I am then Farm Shops are a great alternative. And don't forget - the big online global farm shop that is the Xbox 360 Indie Games section (it's tucked away near the back under the download games, hiding after the demos) has a whole couple of weeks of new games ranging from a tiny 65p to an epic £3.20 (80 to 400 points in M$). There is even a list at http://www.indiegames-uprising.com/ so you can spot the featured gems more easily. Epic Dungeon is my favourite so far, but I haven't tried them all yet!